All transactions are safe and secure with a reliable history in online purchasing behind each of our associates. 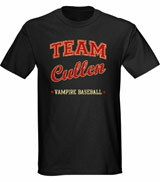 Buy the Team Cullen t-shirt to own Eclipse clothing and merchandise. Show everyone that you run with Edward (Robert Pattinson), Alice (Ashley Greene), Carlisle (Peter Facinelli), Esme (Elizabeth Reaser), Jasper (Jackson Rathbone), Rosalie (Nikki Reed) and Emmett (Kellan Lutz). Whether you are cheering them on while they play baseball or just wish you were a part of their unique family, this Team Cullen t-shirt is just right. To get pumped up even more, wear it as you listen to the Eclipse soundtrack. In addition to the Team Cullen tee above, browse the Eclipse Clothing Gallery for more apparel like men's and women's clothes, kids shirts or hoodies.